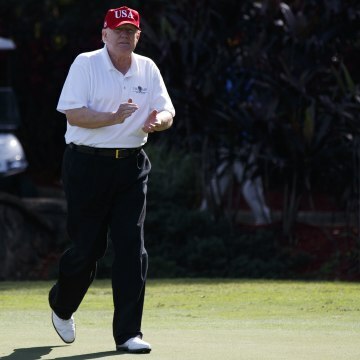 President Donald Trump is spending the holidays at his Mar-a-Lago estate in Florida, which is just a short drive from Trump International Golf Club. 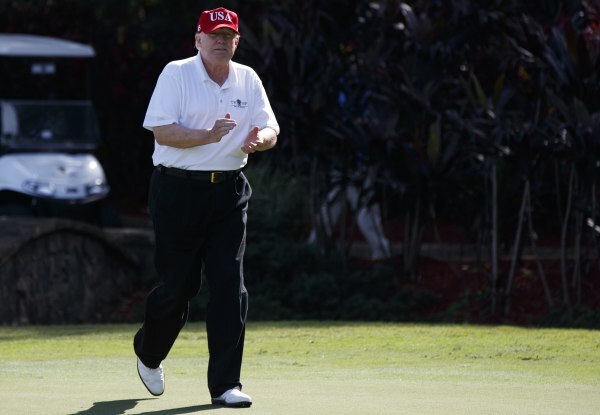 And while the White House has been reluctant to say whether or not the president has been hitting the links, Trump has been repeatedly spotted on his course with clubs in hand. On Christmas evening, Trump tweeted, “tomorrow it’s back to work” — but the next day, the president’s agenda included a round of golf. In fact, the president was seen at his golf course three days in a row, an indication of Trump’s love of the game. Trump is just one of many presidents who have been passionate about golf — even though he criticized his predecessor for hitting the links too often. “He’s played more golf than most people on the PGA tour!” said Trump of former President Barack Obama during an October campaign event in 2016. Two months earlier, while on the trail, he had told a crowd of supporters he was going to be too busy as president to play his favorite game. However, there seems to be time. NBC News has been tracking the president’s golfing habits and found that he has spent 90 of his 345 days in office at one of his golf courses — that’s a quarter of his time as president. Professional golfers who’ve played with Trump say he’s actually good. That would make him pretty good, since every president in the past century except Hoover, Truman and Carter has golfed. But his swing, much like his presidency, is unconventional. Experts have faulted him for his backswing and the angle of his shoulder and elbow, but say that’s all corrected by the time the clubface hits the ball. What matters most, they say, is that he’s consistent and hits the ball with a “stable” clubface. Golf Digest ranked him the best golfing president in history. His handicap is in the single digits, though some question if it’s legitimate. He’s also the winner of 19 club championships — all at his own courses. There was also the time he got a hole-in-one, and then made Jeff Immelt, the CEO of GE, tell the story on-camera to a gathering of business leaders at the White House. “I actually said I was ‘the best golfer of all the rich people,’ to be exact,” he said. Trump’s golf business is now officially run by his son Eric, who oversees the Trump Organization’s 19 courses worldwide. Membership at his clubs is for the wealthy, with some fees in the hundreds of thousands of dollars. In Trump’s most recent financial disclosure, he reported an annual income for the golf clubs totaling more than $150 million. Many of the president’s most fervent supporters would be hard-pressed to pay those kind of fees. In interviews, he’s said he wants golf to serve as a motivation for success. For a populist president, it’s not a populist message.